So here’s how to be a success on Pinterest. This Pinterest tutorial will guide you step by step through a simple process and set up to creating a following, driving traffic, and peaking interest on the social media newcomer.First, you MUST decide if your space will be a personal space or a space to promote yourself, your store, and your art form, whatever it may be. 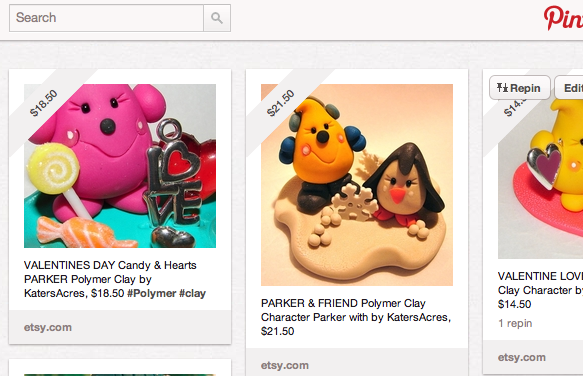 My pinterest is for my store, my brand, & my passion, Polymer Clay. Yes, it has personal thing on it…but the first 8 boards are the most important…we’ll get to that in a minute. 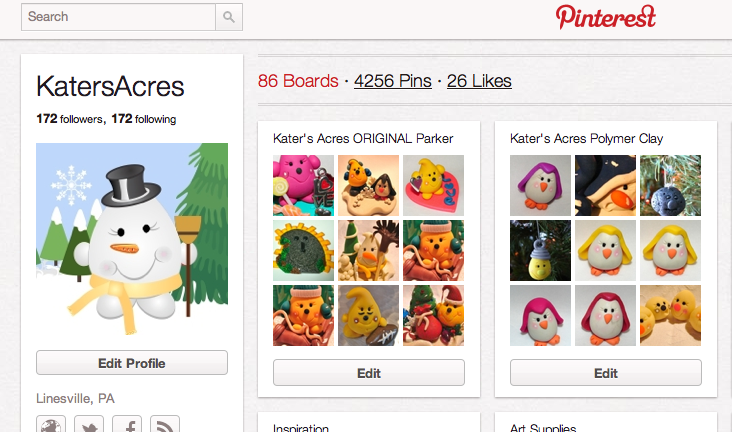 Find & Create pin boards that are just like what you do & make them the FIRST & MOST FULL boards on your page! For example, for me, I have Kater’s Acres (my store) listed first, then my branding (Parker), and then my polymer clay main board, then all things relating to polymer clay (tutorials, tools, etc). Followed by Etsy things and then my personal cute stuff. Read how to do this below. See the “Save Arrangement Button” in the top right? On the top RIGHT corner, click on your name. This will automatically take you to your landing page…your BOARDS! Next, click “ARRANGE BOARDS” in to top right corner of that page. Arrange your board so it’s pleasing to you, your business, your brand, and others too! The most important part: CLICK “SAVE ARRANGEMENT” when you are done! You’re probably wondering, “why mix business with personal?” If you are pinning things not relevant to your business, people will not follow you. They will decide all you do is self promote. Don’t you get tired of your TV networks running the same 5 commercials all the time? It’s based on the same principal: we like variety. By having your business Pinterest page set up this way, you can promote yourself, your brand, and your other artists & things related to your art without being pushy and self serving. I’m going to use myself as an example. I searched for “polymer clay” under boards, people, and tags too. Then I follow all the boards & people that these correspond too. This will up the amount of people who repin your work (after you pin it first of course) if you are in the field. Not to mention that people who you follow & repin using this method will get sent an email (if their option is turned on) and may even follow your board back that relates to your mutual art! This translates into the all important back-links, views, and hearts. Easy, common sense will get you far in Pinterest. Further than either twitter or FaceBook will. Search for your craft, hobby, art, etc. — When you do this you will see three options: pins, boards, people. Go through ALL the links under “BOARDS.” — Follow all of them that are full. There’s no point in following boards with zero to four pins….they aren’t used frequently enough. Go through ALL the links under “PEOPLE.” — Again, pin them all! Go through ALL the links under “PINS.” — This category will be the biggest and could honestly take you DAYS to get through….don’t be in a hurry, but pin whatever you want. Pin your own work. BUT…when you do, make sure you do these 2 things:Comment on YOUR WORK that others have repinned. Why? Because with pinterest you can change what you originally posted it under….but you CAN’T remove comments. Comments like “Thank you for pinning my work.” will leave the link to your Pinterest landing page where you SHOULD have linked your website, twitter, blog, etc. Tag yourself! Use @YourUserName to your pinterest page is linked to that item…at least initially. Search for repins that you may not have been notified about. You’re probably thinking I crazy right…that would take hours. Yes, it might….but if someone “repinned” your work and one of their “followers” “repins” it again, you will NOT be notified of this repining…..go find your item and comment. It will keep you associated with it right on Pinterest. This means people don’t have to CLICK on the item to see it’s yours. I hope this helps! ENJOY becoming a Pinterest addict! >Thank you for the tutorial! I have some work ahead, but at least I have some direction! Click here to change your settings…. Also, is it possible to stop the emails when someone repins? I'm afraid that when I'm on a trip and try to check emails (web connections at motels are notoriously SLOW) all the pinterest emails will clog the downloads and I won't be able to do anything. I could reinstate the emails when I return.